Love is in the air. Men are falling for their operating systems, Fifty Shades of Grey is on its way to the silver screen, and women are finding romantic escapes through texting. This Valentine’s Day tech story is brought to you by Pink Kiwi, the Boston-area makers of a new iOS app called Lovelines. It’s aimed at women, and here’s the premise: You take part in an interactive story where you’re exchanging texts with a new flame. As of this week, there are five fictional storylines (and men) to choose from; each has its own backstory. The app is completely text-based, except for a profile picture of the guy. Users get a choice of mock text messages with which to respond as they step through the story. Think “choose your own adventure” meets romance novel, all via texting. The stories get steamy enough to warrant a 17+ age restriction. The most popular one so far involves “Marco,” a dreamy graduate-school mentor who helps the user write a paper on the psychology of desire. Mucho flirting and scandals ensue. 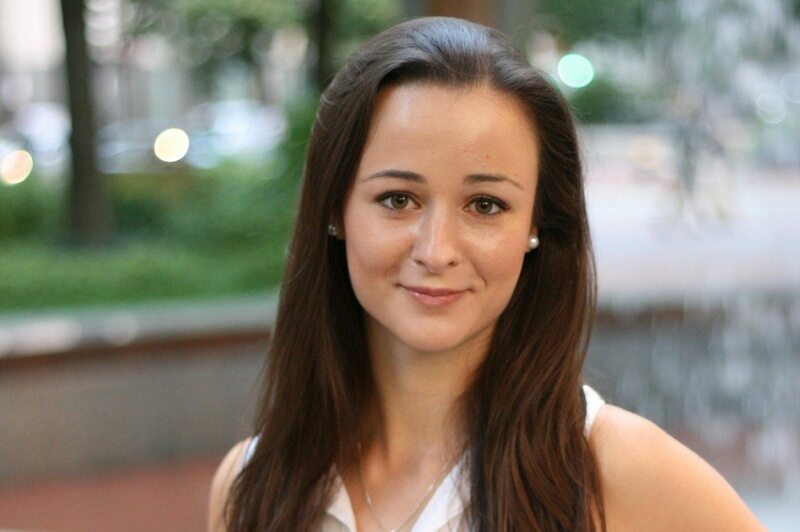 Lovelines is the brainchild of Olivia Dufour (pictured), a Montreal native who moved to Boston in 2011 when her previous startup, Goodify (fka Invup), took part in the MassChallenge accelerator program. The company won $50,000 in the competition. By day, Dufour now works at a large IT company. By night and weekend, she’s trying to create a new mobile publishing platform. Interactive fiction on computers has been around since before the dawn of PCs—the first adventure stories were written for time-sharing systems like the DEC PDP-10 mainframe. But Lovelines represents a new evolution of the genre for smartphones. As Dufour, 26, sees it, a generation of young adults has grown up with texting and Twitter, and short snippets of content provide a new opportunity for storytelling and entertainment (see app screenshot). “The goal is to scale the model for different types of stories,” Dufour says. Eventually, she hopes to develop a software platform for people to submit their own interactive stories—all based on texting and without a lot of visuals, which is the domain of games and other approaches. “Because of its simplicity, it really taps into the imagination of people,” she says. Just like a game, however, the app can provide a welcome escape from real life. “There are crazy interactions, but no risk,” she says. So why start with romance stories specifically for women? “Women are more psychological when it comes to love. We thought it would be easier to create an experience for them,” Dufour says. I couldn’t help but notice that the texts from “Marco” look like they were written by a woman. (No guy outside of a Harlequin novel would say, “There’s something between us. At that first meeting I felt it.”) Dufour admits that’s true. “We know what we want to hear,” she says.